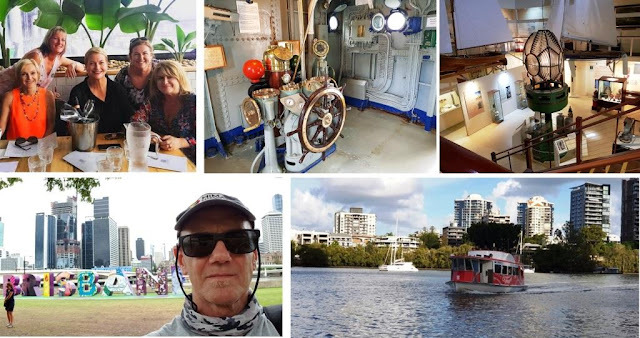 For those who are followers of my blog's Facebook page (if you're not then I'd love you to pop over and hit the "Like" button to get my updates) you'd know that I've just returned from a fabulous week's visit to Brisbane in Queensland (Australia). We live in Western Australia and I'd never been over to the North East coast before, so we threw caution (and a bit of money) to the wind and booked some tickets and an air bnb and flew on over. The flight was 4½ hours (plus a two hour drive to the airport from where we live) - and then a 15 minute taxi ride brought us to a lovely little place that I booked through air bnb. It was right on the river in Kangaroo Point and when we walked in and saw the view from the sitting room window, we knew we'd chosen well. An added bonus was that we were only 15 minutes from the heart of the city using the free City Hopper ferries. 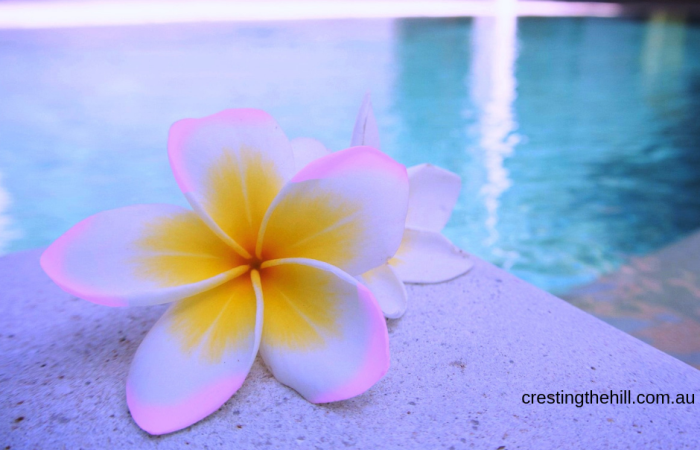 The icing on the cake of visiting Brisbane is that it's home to some lovely bloggers who I've become good friends with online but have never had the opportunity of meeting IRL. The most important one was, of course, Sue from Sizzling Towards 60 and Beyond, and as soon as I let her know our plans, she was organizing a lunch date and then a second date to catch up with the other girls later in the week. So Day 1 lunch was with Sue and we talked for 4 solid hours! It's amazing how we instantly felt like old friends and how much we had in common to chat about! Meeting Sue - with the view from our air bnb behind us - perfect! When I finally got back to my husband we ferried off to spend the rest of the afternoon and evening at South Bank - and what a wonderful spot it is! 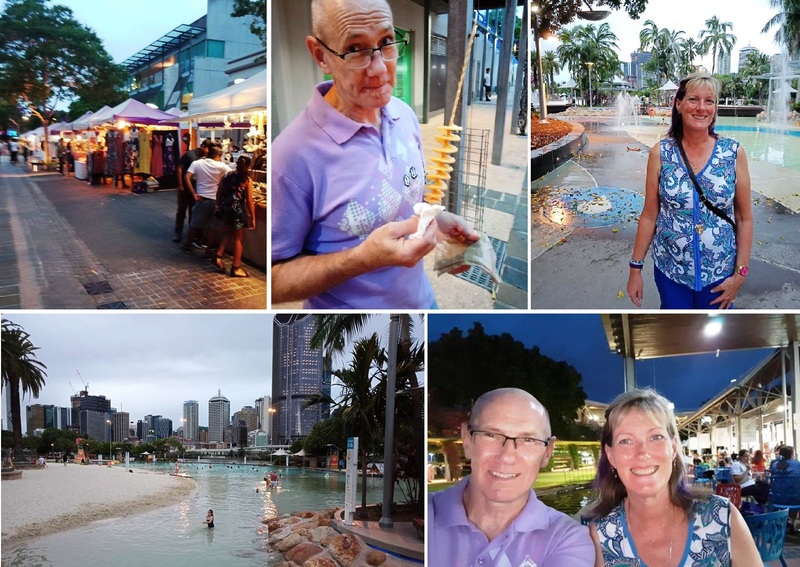 So much to see and do with walkways through gardens, a huge free-to-the-public swimming area, great places to eat, and an evening markets to browse through before we headed home. Saturday, time to be tourists - so we headed off on a day tour to the Eumundi Markets - over 600 market stalls full of handcrafted items, food, clothes, shoes, jewelry and so much more. We browsed for a couple of hours, ate lunch and then visited a lovely little European styled town called Montville in the Hinterland. Then it was off to Mary Cairncross Reserve to check out the rainforest and to view some of the highland areas - so much beautiful scenery before heading back home. 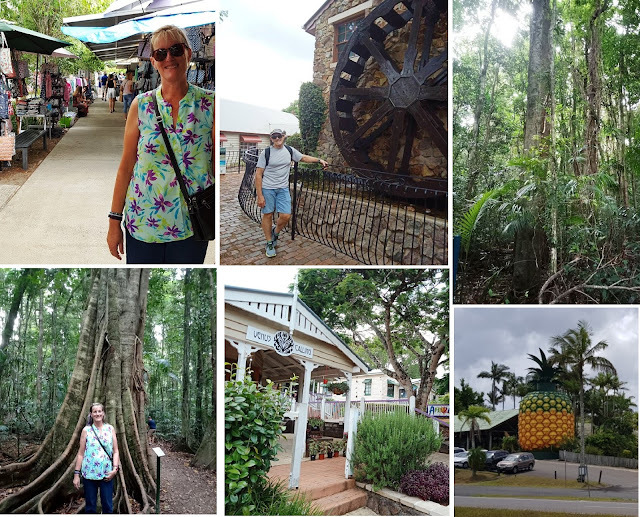 Eumundie Markets, Montville and Mary Cairncross Reserve + we passed the Big Pineapple! 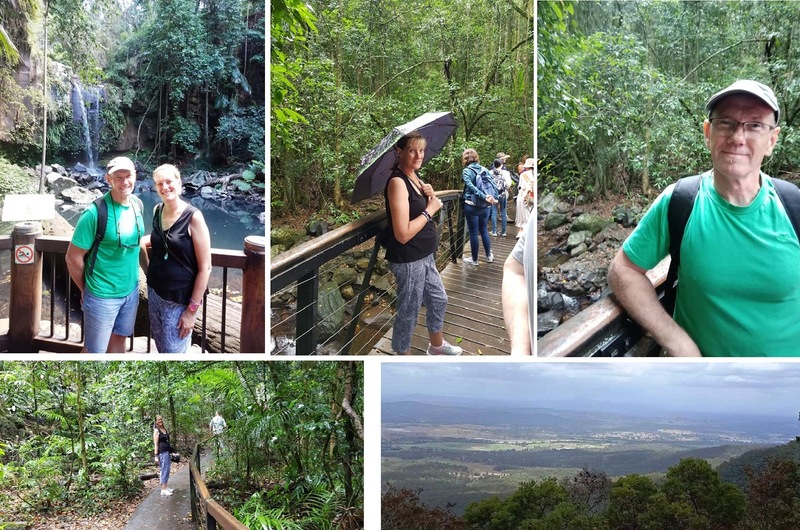 Sunday, and day touring again - this time we headed off to Springbrook National Park, then to Mount Tambourine and the Cedar Creek Glow Worm caves - with a lovely winery lunch to top it off. Then to walk off a few calories we were taken to Curtis Falls with a rainforest walk followed by a stroll through a little town called Gallery Walk. I managed to get my shopping vibe on and bought a lovely dress and a sparkly pair of sandals from a little boutique I couldn't walk past - a very rewarding day indeed! 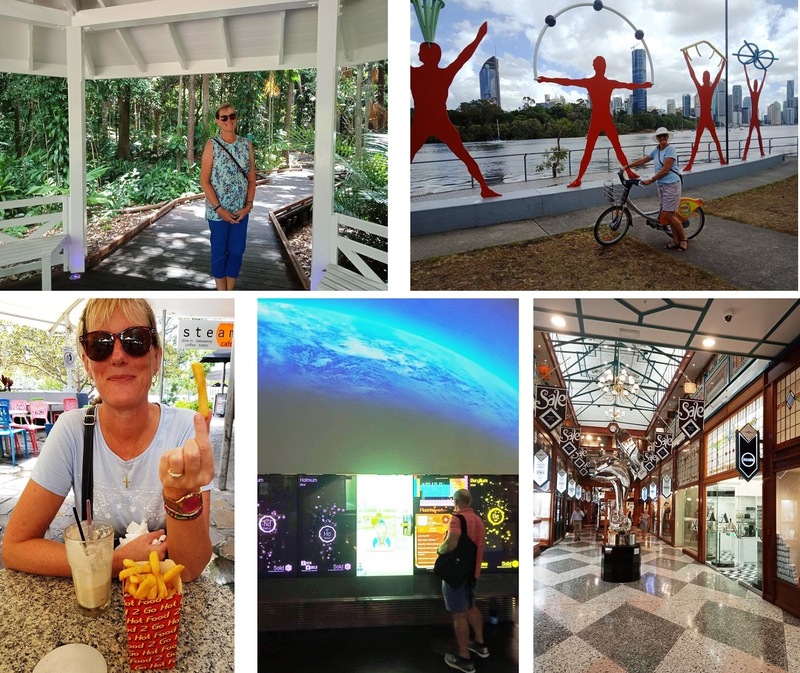 After all the walking we did over the weekend (15,000 steps each day according to my trusty Fitbit), we decided to take it a little bit easier and check out what the city of Brisbane had to offer. We ferried across on Day 4 and checked out the Botanical Gardens and the City Centre's Queen Street Mall. Then on Day 5 we hired bikes - they were cheap and fun to ride along the relatively flat riverside to the QUT and then to South Bank for lunch. We finished both days with a quiet dinner at Dockside and home for some much needed rest. 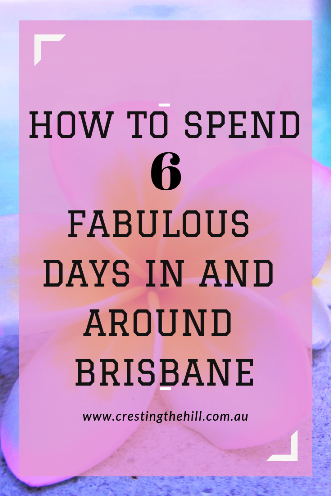 The last full day of our Brisbane adventure and time for a lunch catch up with some of the lovely Queensland bloggers I've become friends with. 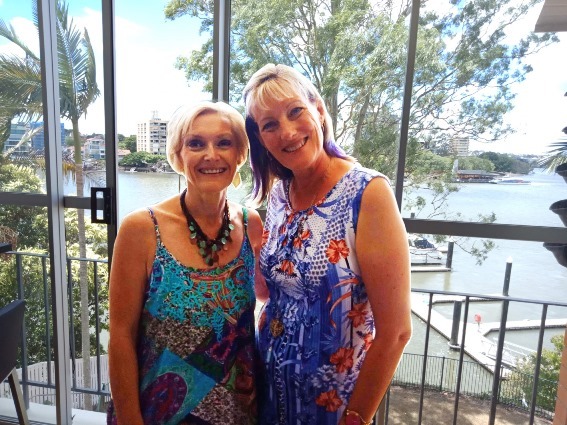 Sue from Sizzling Towards 60, Jo from And Anyways, Min from Write of the Middle, and Deb from Debbish - what a fabulous group of women and the time just flew by as we sat in a lovely restaurant on the Brisbane River and enjoyed good company and good food. Meanwhile Ross took a hike to the Maritime Museum and checked out what else was along that side of the river further down South Bank. All in all, a lovely day for both of us. Catching up with the Qld Bloggers, checking out the Maritime Museum and riding the City Hopper Ferry. Around lunchtime on Day 7 we headed off to the airport and back to sunny Perth, then home to our cat (who was very happy to see us again). A wonderful week of sight seeing, city exploring, eating, socializing, and generally enjoying all that Brisbane and its surroundings had to offer - we'll definitely be back one day! Your trip sounds lovely! And your photos are gorgeous. So wonderful that you got to meet up with other bloggers. Thanks for sharing. It was a fantastic opportunity to touch base with them all Janet - Sue did a great job of getting us all together and we TALKED a lot! Cheryl I was surprised at how much I enjoyed Brisbane - I think what they've done with South Bank really was the icing on the cake - it was such a nice contrast to the city on the other side of the river. Don't forget to include Rottnest in your holiday plans when you're back - I still think it's the best place for a beach break. Just popped back to share for #mlstl Leanne! Yes the humidity is hard to take when not used to it. Sounds wonderful. You certainly packed in lots of activities. What a treat to meet IRL some blogging friends. I didn't realize there is a real place called the Hinterland. I use that when parking lots are busy, as in "I am parked out in the Hinterland!" Your use of Hinterland is pretty spot on Haralee - it was out the back of beyond somewhat - but beautiful to see and very relaxing to putter around visiting. What an action packed trip to Brisbane, Leanne! Covered all the bases. It's always uplifting and just plain happy making to be able to catch up with people whose words you read each week in real life. We had such a great time SSG - lots of variety and that makes for a good mix for my husband and me (we're VERY different in what we want from a holiday) and yes, meeting the girls was such a heart happy time for me - just like old friends getting together. Leanne! Your trip sounds fabulous and how wonderful that you were able to meet some of the bloggers you've gotten to know in eSpace. Coming to Canada anytime soon? I've been watching "Clash of the Collectables" on Netflix and have had the odd glimpse of that coast. Australia is increasingly on my list places to visit!! Thanks for sharing with us! Maybe you'll get to Australia before I get to Canada Agnes. Sue is heading that way sometime this year - you could all hook up and talk the day away too. I loved that you girls were the same Min - a friend of mine who saw our photo said we all looked like we belonged together - which was a lovely compliment. 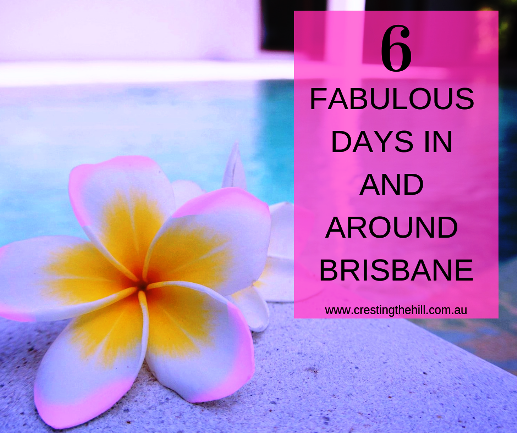 I might have to wait til I retire before I can pick and choose the month I visit next - but I'm telling people that you said May was the best time to see Queensland! It's a shame Australia is so far away from all the overseas bloggers Kim - but on the other hand it's nice to be far away from a lot of the political stuff that's rife in our world! What a fabulous trip! I love seeing that photo of you and Sue together. I forget how large Australia is, it seems like you should just be down the road from each other. Of course people think that about the US too. It is four-5 hours by plane for us to get to the west coast and two to four to get to the east coast. Australia really does look so incredible beautiful. We hope to go there one day, maybe after my husband retires because getting to Australia takes some serious time so we will have to see a lot of it while we are there! Australia seems to be a LOOOONG way away from almost everywhere Michele - I was talking to a couple of girls from the US on one of our day trips - they'd been flying for almost two days (including layovers) to get there - but they reckoned it had been absolutely worth the time and effort - it made my 4.5hr trip look like a hop, skip and jump! It was great Jennifer - my husband loved it too (it's hard to find vacations that appeal to both of us) and the girls were definitely the icing on the cake of the holiday. What a fun, fun, fun time you had! I'm so happy you got to have such a wonderful week on the East Coast and got to meet some friends too. Trisha it was such a wonderful time away - definitely worth the dollars, air time, road time and whatever else to get there and to meet the girls (especially to see Sue - who is just as lovely in person as she is on her blog). What a great week it was for you both. You certainly chose well for your accommodation. I have not visited Brisbane other than when I was a child. I went to the Sunshine Coast a few years back and met up with two great blogging friends who both lived there then. One is Nikki from Styling You who is now in Brisbane (and launched her own clothing label last night) and the other is Stacey from VeggieMama who is in Melbs now. 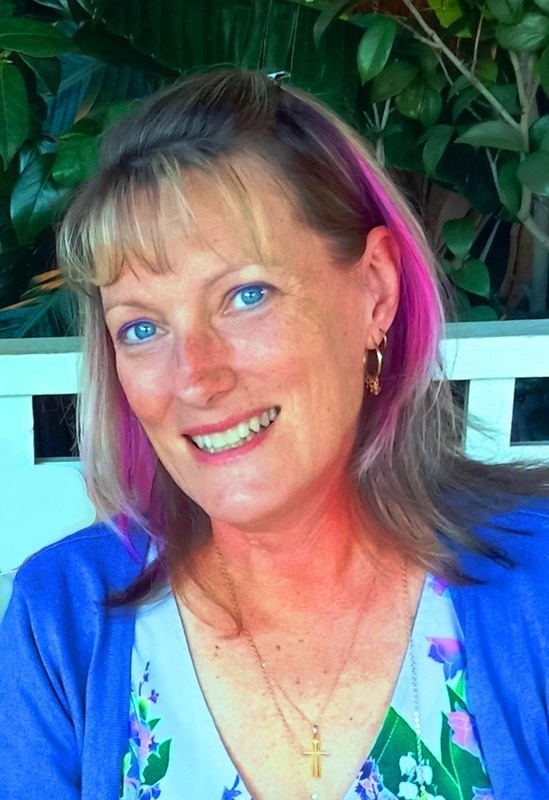 I have, over the years met up with many bloggers at events and conferences and it sure is the way to connect! We already know much about each other so just chat as if we've been friends for years. That's what it felt like Denyse - like old school friends catching up with each other. There was nothing new or awkward, no pauses in the conversation, just light and easy and honest - perfect. And yes, our accommodation was such a blessing - great value and big enough for us and still close to the city - and those wonderful free ferries! Jo you would have LOVED every minute of that lunch with the girls! I thought about you while I was there and how you were my first blogger to meet in real life - it certainly took the worry out of what it would be like. It's like you've known someone for years when you've been reading and commenting on their blog isn't it? Loved seeing this post again. Follow your trip was fun for me too. I haven't seen anywhere near enough of my own home State Christie - it's a big place! But I'm gradually getting the capital cities crossed off for the rest of Australia - a couple more to go and then we'll stretch it a bit further. And it was lovely coming home to our cat and settling back in. How exciting that you got to meet all the lovely bloggers from this corner of our blogosphere. And, I was interested to here how LONG a trip it was, not only across a country but the whole continent. It looked like an absolutely fantastic trip! It was a long haul to get there - but nowhere near the distance and time it takes to get to most places from Australia - we're a long way from almost everywhere! Definitely worth it though and we had a wonderful time. It's so beautiful there! And sunny and warm! I have to admit that I am jealous! It was definitely warm - a little bit more humid than we expected but apparently that was due to the time of the year. When you work you don't always have the option to pick the perfect time - but we were barely rained on at all and that was apparently quite unusual - so I'll take the humidity over rain any day! Leanne I have to say I am jealous. I think it would be so awesome to meet other bloggers irl. You trip sounds so fun. Victoria it was such a blast meeting them all - especially Sue because we've been saying we want to meet for years. I always thought she'd come to me but fate works in mysterious ways! It's a lovely place Kippi - similar to Western Australia but a bit more tropical - and they've done such a great job with South Bank. Just catching up on this now. You guys managed to fit so much into your time. I'm glad you got to see the part of teh world I call home ie the Sunshine Coast. Mostly though it was just fabulous to meet you in real life. It truly was like catching up with an old friend. And that, in a nutshell, is why I love blogging. Me too Jo - it's so strange that you can live thousands of miles apart and yet have so much in common. It was wonderful meeting you girls and I want to do it all again! How wonderful that you got to meet up with these friends, Leanne!! I feel like these relationships are the best part of blogging. Looks like a lovely time. Australia's definitely on my bucket list..dreaming anyway!